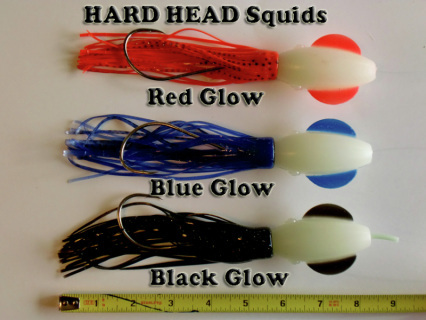 The Hard Head Squid is 8 1/2 inches long and an excellent choice for small to large sized halibut or other saltwater game fish. The Hard Head Squid lure can also be trolled for salmon, halibut, lingcod, tuna, yellowtails or any fish that eats squid or baitfish. When other lures fail to attract fish, give the HARD HEAD Squid lure a chance to attract fish! SECURE CHECKOUT! Comes rigged with single 9/0 J-hook on heavy mono line. All products ship by US mail. Most orders ship next business day.